The Cambridge Dictionary defines 'Discovery' as the process of finding information, a place, or an object. And the Oxford one says, "it's the action or process of discovering or being discovered." For me, 'Discovery' is a magical word that holds the promise of seeing, experiencing and finding something that both enriches and rewards. 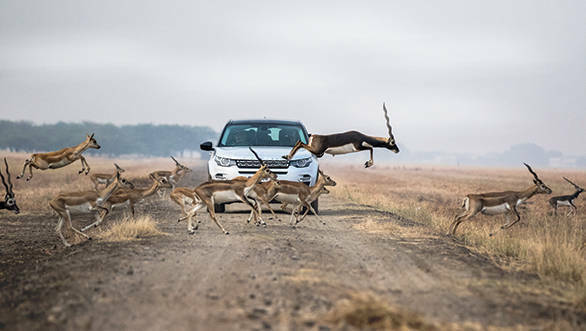 And I am fortunate that something pretty much like this happened to me very recently, when I had the chance to go on a 'Discovery Drive' with Diinesh Kumble, a self-taught nature photographer. For some time now, I wanted to escape from the city and once again discover nature and its untamed beauty. Then an opportunity presented itself where I could go with Diinesh for a photo expedition. The choice of destination and vehicle was mine, and I selected Velavadar, a lesser known Indian wild wonder. Mainly because the majority of national parks and reserves in India are set up for the protection of the endangered tiger. 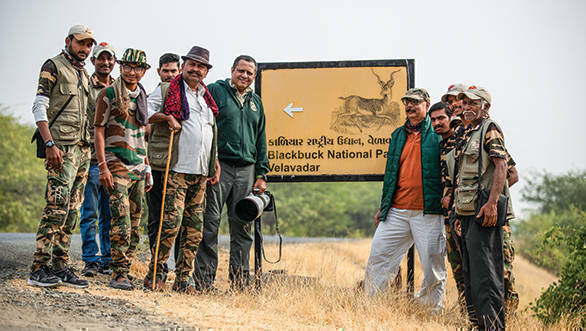 But there are no tigers in Velavadar and as the name itself conveys, Velavadar Blackbuck National Park was established for the preservation of the Blackbuck, which is perhaps the most graceful and beautiful antelope of its kind. 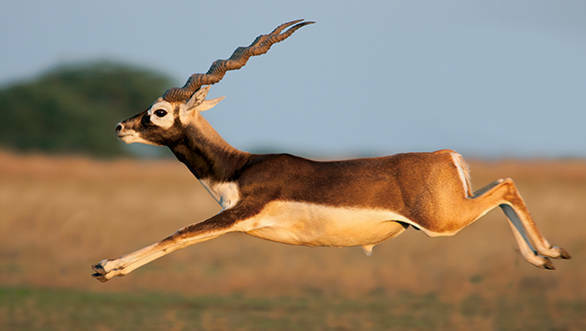 It is also one of the fastest animals capable of achieving speeds while leaping, of up to 80kmph! As for the vehicle, the choice was also vital as Velavadar is one of the few places where one can drive private vehicles inside this protected forest area. 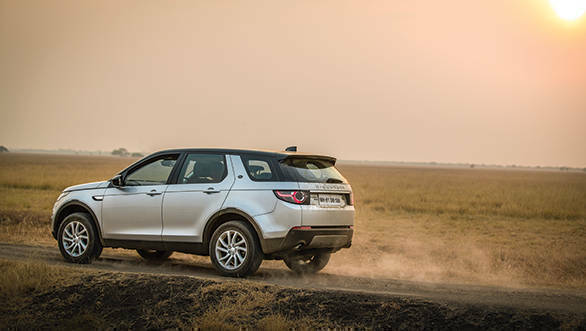 The decision was an easy one because the good folks at Land Rover were happy to provide a Discovery Sport, and being aware of this SUV's all-terrain capability, smooth ride and efficient performance; I too jumped at the chance. 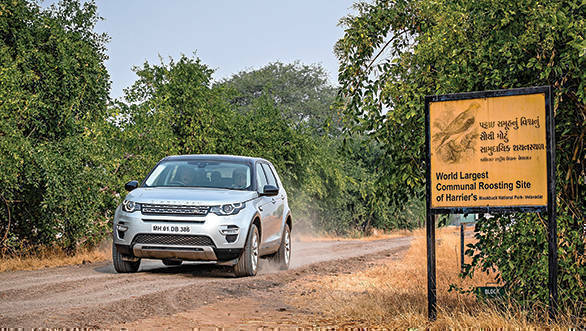 The fact that Land Rover has had a long history of association with wildlife and nature conservation, also makes the Discovery Sport the ideal machine for the series of 'Never Stop Discovering Journeys' we at OVERDRIVE are embarking on, starting with the first one featured here. 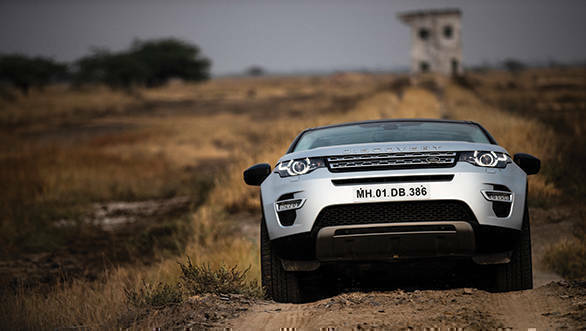 The journey to Velavadar (about 600km from Mumbai) in the Land Rover Discovery Sport was comfortable. En route, Diinesh and I got to know each other, something that is very useful when you go on safaris to sight and photograph wildlife. 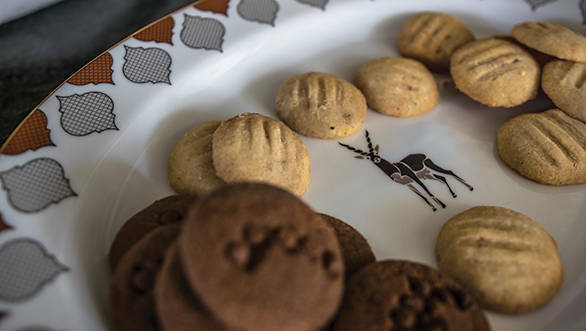 On reaching Velavadar, we parked ourselves in the charming and inviting Blackbuck Lodge, where the Founder and Director, Mickey Desai, ensured we were well looked after. 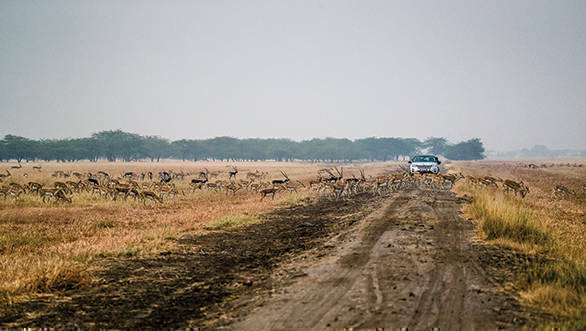 The next morning we set off for our first safari in the Velavadar Blackbuck National Park, which is a fascinating African Savannah like habitat located in Gujarat's Saurashtra region. It is a unique ecosystem that now has the largest density and population of Blackbuck in India, with some 3,500 of them living here. Given such a large population, the chances of sighting one are very high and when it leaps or runs, the Blackbuck is one of the fastest mammals in the world. Before entering Velavadar, we spoke to some of the forest guides and guards and having got the 'khabar' or information of the forest and understood the lay of the land, I positioned our Land Rover Discovery Sport in a part of the grassland where Blackbuck herds gather to soak in the morning sunlight. 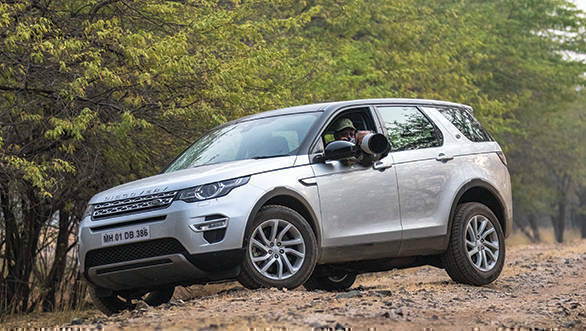 Diinesh and I waited patiently and were thrilled when a large herd chose to cross the path right in front of our Discovery Sport. First they walked and then they started to leap high. This was truly a sight to behold, especially the adult male's pronking (sprinting off the ground with all four feet in the air), a behaviour Diinesh told me was designed to advertise the antelope's fitness and ward off predators. He also acquainted me with the fact that the magnificent grasslands have 39 species of golden grasses. 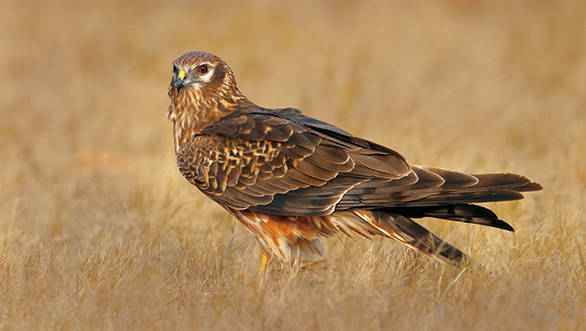 In winter, Velavadar National Park hosts the world's largest harrier (long-winged birds of prey) roost. As the sun sets over this natural paradise, hundreds of harriers, sometimes up to 1,500 that have migrated all the way from Central Europe and Russia, come down to the ground and settle in the tall grass for the night. It's an awesome sight for any raptor fan. 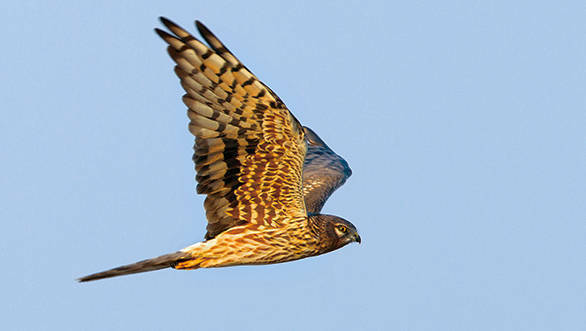 Interestingly, these harriers are predators of locusts, which are a great problem for farmers. Thanks to this, the locals love them and look upon them as pest-controllers helping them with their agriculture. But ironically now, harriers are themselves falling prey to excessive use of pesticides by our farmers. In fact, several harriers are said to die every year after eating insects that were killed by the spraying of pesticides! 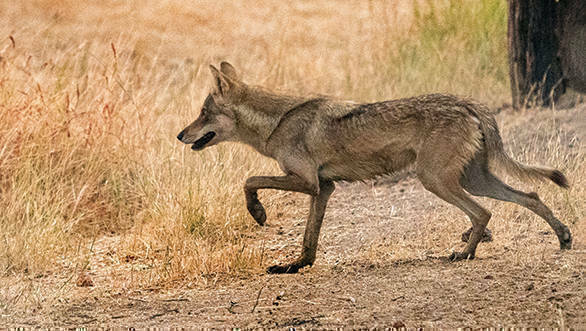 The endangered Indian Grey Wolf is the prime predator of Velavadar and thanks to the successful conservation programmes, their population is proliferating. In fact I saw them on two occasions, and both times I was completely spellbound. The first was when I was sitting in the verandah of my cottage having my morning tea. I noticed that some of the Blackbucks in the vicinity appeared nervous and kept looking at the bushes in the distance. Soon a wolf charged out and the Blackbucks took off with the wolf giving a spirited chase. Next morning, a similar scene played out in front of Diinesh and me inside the National Park, only this time it was a pack of five wolves that were chasing a herd. While we saw the whole stunning scene very clearly, the light was too weak for photography. 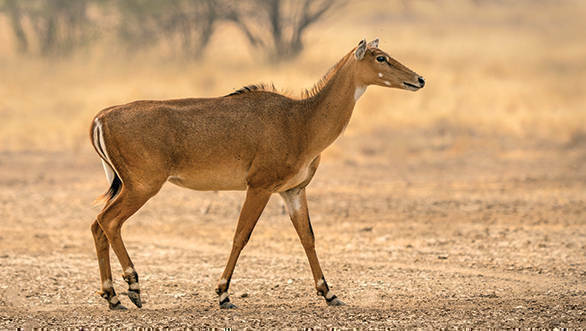 Other wildlife seen in Velavadar includes the Neelgai or blue bull, the nocturnal striped hyena, Indian fox, golden jackal, jungle cat, desert hare, mongoose, hedgehog and wild boar. This National Park and its nearby wetlands are also an ornithologist's (birdwatcher) delight and it's classified as an 'Important Bird Area' by BirdLife International, a certification of its avian diversity. Many species of butterflies and reptiles also live here, the latter including the saw-scaled viper, common cobra, common krait, rat snake, sand boa, etc. Velavadar is a wonderful wild land and discovering it with Diinesh, who is a treasure house of knowledge, is a memorable experience that will stay with me forever. I strongly suggest that those of you who want to savour Velavadar's spectacular beauty, head there now. 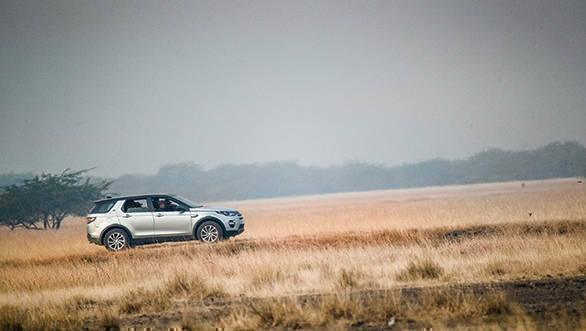 What makes it more attractive for us motoring enthusiasts, is that this is one of the few parks left in India where you can take in your own vehicle, just like we took the Discovery Sport. But do remember, animals have the right of way. Always. Diinesh Kumble is a self-taught photographer who has lived most of his life in Bengaluru, India. He returned to his home town in 1994 after completing a Master's degree in Chemical Engineering from Texas A&M University, USA. 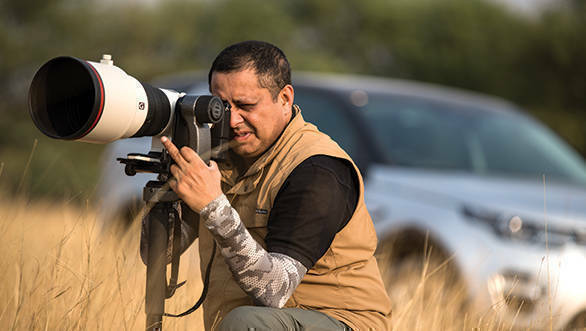 Diinesh started his photographic journey in New York in the early 1990s and in his voyage as a photographer, Diinesh developed a keen passion for wildlife and nature photography. Over the past decade, Diinesh has been instrumental in publishing six coffee table books filled with his images and stories; three of which were commissioned works undertaken for the Government of Gujarat. "Kutch - A Pictorial Journey" was highly acclaimed by the then Chief Minister of Gujarat, now Prime Minister Shri Narendra Modi. Diinesh runs a creative boutique and publishing company too, which has been instrumental in developing KAADOO - a wildlife themed board and card game. He also offers a range of fine art photographic prints in both black and white and colour, unframed and produced using the highest quality print media. Each print is individually numbered, signed, and accompanied by a 'Certificate of Authenticity'. Diinesh says, "My mission is to seek, probe and prod until I get the desired result. I am happy to share my knowledge and experiences to the best of my abilities." 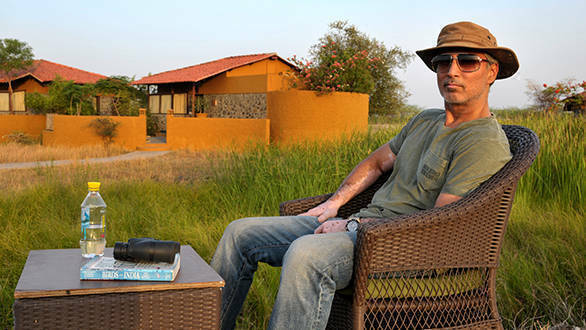 Mickey Desai is the creator of the nature friendly and serene Blackbuck Lodge in Velavadar, Gujarat. 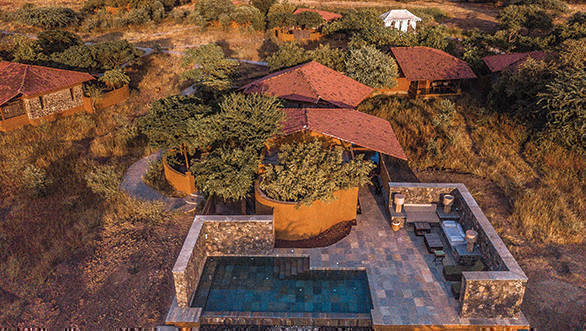 This is easily one of India's finest wildlife resorts, and it's reason enough to plan a trip to the Velavadar Blackbuck National Park. In this majestic tapestry of the wild, the Blackbuck Lodge is spread across 70 acres, and wildlife comes literally to your doorstep making it a really great place for those who want to revel in nature's breathtaking beauty. 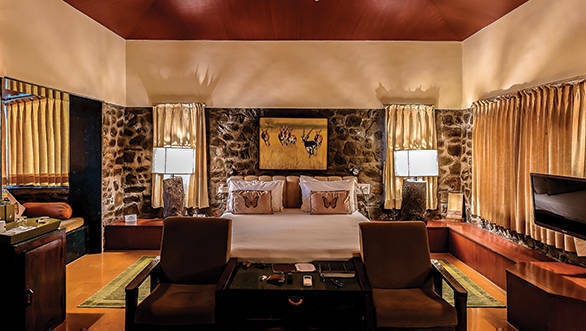 The lodge has exceptionally comfortable rooms and suites, some even with their own attached private pools. The food is succulent and includes farm fresh organic vegetables and local cuisine along with the best of western fare. Well-trained naturalists accompany guests on wildlife safaris and make excursions to the forest, educative and rewarding. The Blackbuck Lodge truly pampers you and is a most inviting destination for a journey to one of India's natural marvels. 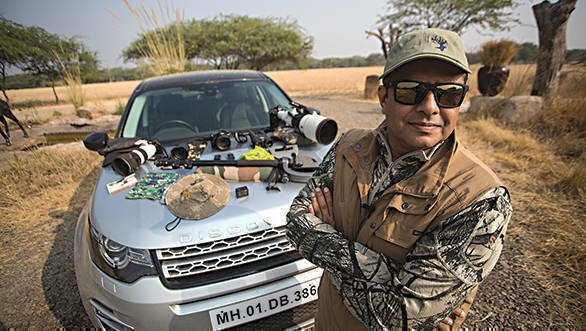 Mickey Desai says, "Most wildlife tourism in India is centred on the Tiger. I chose to establish my lodge in Velavadar because the grasslands here are inhabited by the largest population of Blackbuck in our country. Numerous other species of fascinating birds and animals live here too, and in my own little way, I want to help preserve this natural paradise through promotion and ecotourism."